I’ve been trying to perfect wine bottle cutting, so I could use the glass tube for a lamp shade. Finally got some good results. I turned pieces of a wooden pallet (maple I think) found on 89th St, for the base and cap. The lamp socket comes from a junked floor lamp (also found on 89th St). White wine gives more light, but I’ll probably go red next time for more mood. 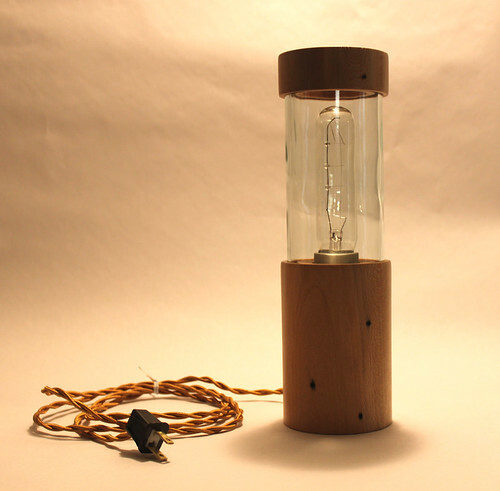 This entry was posted on Monday, May 3rd, 2010 at 11:37 pm	and is filed under Get Yourself a Lathe, I Love Lamp. You can follow any responses to this entry through the RSS 2.0 feed. Responses are currently closed, but you can trackback from your own site.